I still have a lot of hope for learning how the Data Access Classes in Acumatica can contribute to better reporting. 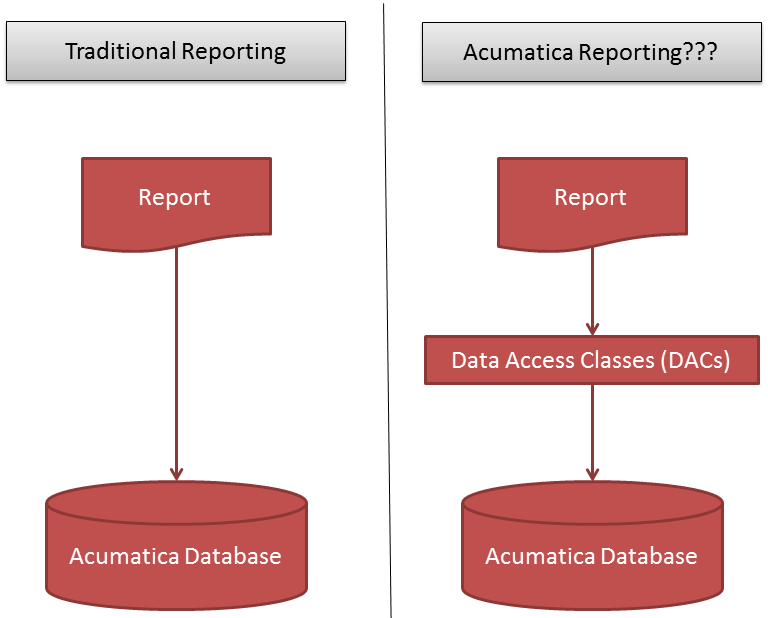 As far as I can tell, I think the Data Access Classes function like the Acumatica Reporting??? side of the picture below. However, I think that I’m going to revert to my comfort zone for a little while to see how well I can create reports directly against the Acumatica database like in the Traditional Reporting side of the picture below. In more traditional ERP systems, your only option is to report directly on the database so this is what I’m used to. Gabriel Michaud’s comment on a previous post made me hopeful that the Acumatica development team will eventually be able to tie their Excel connectivity feature (new in version 4.1) directly into Microsoft Excel’s Power Query and Power Pivot features. However, until then, I have decided to spend more time learning to report directly on the Acumatica Database using Power Query and Power Pivot. Over the next several weeks, I’m planning to create a number of different sample reports directly on the Acumatica Database using the Acumatica DEMO company. I’ll be temporarily abandoning the Acumatica Data Access Classes. These reports will point Microsoft Excel directly to the Acumatica Database using Power Query and Power Pivot (maybe even Power Map). This exercise should help me to get more familiar with how the Acumatica Database is laid out.